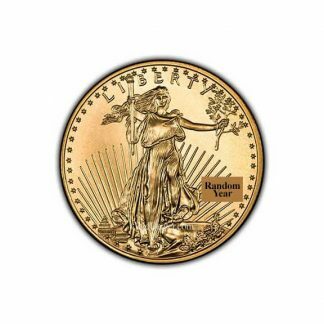 The American Gold Eagle 1/10 oz is a popular gold bullion choice worldwide. 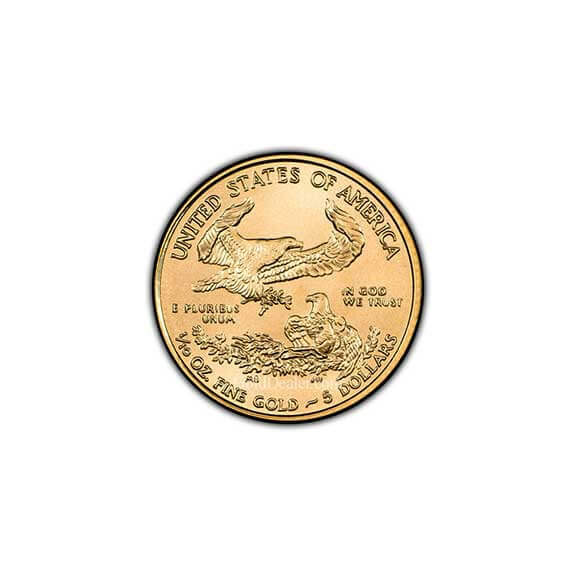 In 1986, the United States Mint introduced the American Gold Eagle series in four sizes (1 oz, ½ oz, ¼ oz and 1/10 oz). From 1986 through 1991 the US Mint used Roman Numerals. In 1992 they began using traditional Arabic Numerals. The front of the coin features Liberty, a depiction taken from the famous $20 gold piece (1907-1933) designed by Augustus Saint-Gaudens. The back features a family of eagles and includes United States of America, E Pluribus Unum, In God We Trust, weight (1/10 oz fine gold) and its symbolic legal tender value ($5). 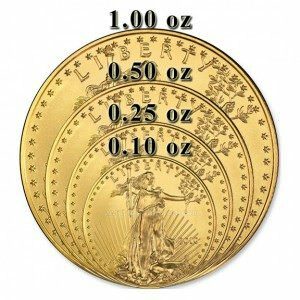 Because of its popularity the US Mint produces quantities of the American Gold Eagle 1/10 oz each year – all of which closely follow the price of gold. 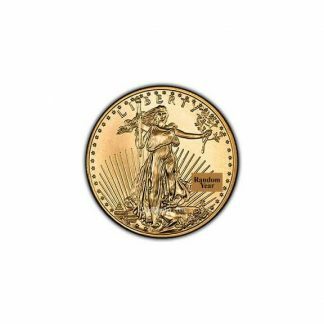 Other reasons for its popularity are: (1) The American Gold Eagle 1/10 oz appeals to a worldwide audience because of its low premium. And it is a popular choice for Individual Retirement Accounts. (2) The American Gold Eagle 1/10 oz is easy to buy and sell because dealers worldwide post daily buy and sell prices. 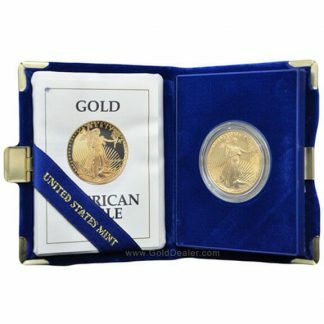 (3) The American Gold Eagle 1/10 oz contains one tenth ounce of the gold so valuation is simple. 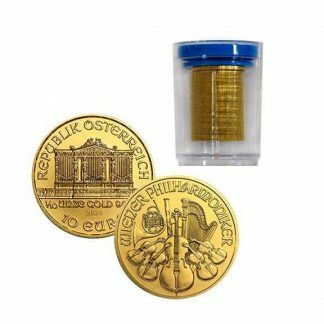 (4) The US Mint places 50 of these gold coins in a plastic tube which allows for easy storage. (5) This coin also has a following in the “survival” community. Those who want a real US gold legal tender coin of smaller denomination for daily needs in case of emergency. 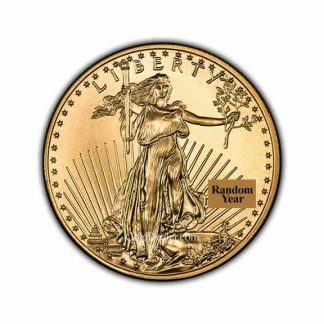 The US Gold Eagle 1/10 oz has no dealer reporting requirement (Federal Form 1099B) when you buy or sell. You don’t have to buy from them to get the best bid, unlike other shops. Second Golddealer.com purchase; ten 1/10s this time and a few other American Eagle weights to make for another nice order. Great over the phone service; outstanding security for delivery ( signature required; not an optional ‘oh gee, just drop it on the doorstop’ type of FedEx / UPS delivery ), and more importantly; they were able to delay the shipment to accommodate some last minute military reserve orders. I do not believe I will become instantly wealthy with my purchase; but I am old enough and smart enough to be properly balancing my portfolio with quality bullion products so as to be able to advantage myself of whatever direction the markets take.